4.8 out of 5 based on 8568 ratings. 5 user reviews. It’s just more than summer training in Noida,- a beginning towards assured success! APTRON Solutions Pvt. Ltd. announces the Summer Internship Training/Industrial Training programs for the students of B. Tech, BE, MCA and BCA. APTRON’s summer training enriches the learners with the technical know how of the various courses and enables conceptual learning. The institute offers summer training programs for the 1st year/2nd year/3rd year/4th year engineering students of computer science, information technology and other streams of engineering as well as for BCA/MCA/BE students. The core technologies covered in APTRON’s Summer Training course in Noida are: Machine Learning | Artificial Intelligence | Big Data Hadoop | IoT | AWS Cloud | Cloud computing | Block Chain | Spark | Devops | Linux | Python | VLSI | VHDL & PCB Design | ASP.NET | Core Java | J2EE- Struts with Hibernate Framework | J2EE- Hibernate with Spring Framework | Embedded System | Robotics | Networking concepts with security and many more. The ongoing advancements in the methodology and the technologies have led to increased level of competition than ever. In order to meet the growing demands there is a need of constant technical enhancement. If you are engineering or a technical graduate/post graduate then summer training is of utmost importance to you because it is one of the best ways to gain in-depth understanding of the practical applications of your respective fields. APTRON’s Summer Training in Noida, is conducted in the month of May, June and July. Our approach for 6 weeks summer internship training is based on the best practices and is a combination of practical and theoretical learning in order to meet the specific requirements. Working on the live Project is one of the core specialty of APTRON’s summer internship in Noida, that sets a benchmark for being the best summer training institute in Noida. If you are looking for quality summer training then enroll with APTRON for the summer training program and transform your career. The Summer Training for 1st year/2nd year/3rd year/4th year CS/IT engineering students is now mandatory for the completion of the degree at several colleges and University. The summer internship training now forms to be a vital part of the course curriculum in one’s degree program. Hence, it is advisable for all the students of B. Tech CSE/IT, M. Tech CSE/IT, BCA and MCA to go for the summer training course. APTRON’s summer internship for computer science engineering students in India/ summer training for B. Tech students invites applications for the summer training course from the students across India in all the areas of Information technology, computer science, computer applications and the associated field at our location in Noida,. We seek to the overall development of the highly motivated students and those interested in learning extensively. At APTRON’s summer training in Noida, the students would experience an exciting time in learning and research about the various technologies and concepts. Our summer internship programs for CS/IT engineering students in Noida have continued to serve the students since years. APTRON is one of the topmost 6 weeks summer training institutes in Noida/ summer internship training institute. APTRON is one of the most renowned ERP Summer Training Institute in Noida offering live ERP project based ERP Summer training in Noida to the students along with 100% job assistance. The ERP summer training course in Noida at APTRON provides enhanced training and corporate exposure to the students turning them into skilled professionals. At APTRON the ERP Summer Training is conducted by industry experts with several years of experience in handling ERP projects and at a reasonable ERP summer training fees. Why should the students of CS/IT/BCA/MCA opt for Summer Training course? It is mandatory for every individual to develop certain set of job skills especially if he/she is a new entrant in the industry and is seeking for the long-term career opportunities and the desired job profiles. APTRON’s summer internship training for CS/IT students in Noida ensures the same by making the students proficient in the required skills in order to successfully acquire a job in the top MNCs. Apart from this most of the colleges and Universities have made summer training mandatory for the completion of the degree course and thus summer internship training course for CSE students holds utmost importance. Summer internship for the CSE students is not merely for completing the degree instead it is one of the most important factors taken into consideration by the employer at the time of recruitment process. APTRON’s summer training for engineering students in Noida, validates one’s skills and knowledge about the particular technology- its concepts and applications. College/University curriculum does not involve learning about the practical implications of the theory and to bridge this gap among knowledge and skills APTRON comes up with its summer internship training in Noida, for all the CS/IT/BCA/MCA students. Summer Internship Training for Mechanical Engineering Students from APTRON is the most efficient way to elevate one’s practical skills. The subject matter experts who are proficient in executing and managing the real-time projects conduct the summer training for mechanical engineering students in Noida, at APTRON. The training methodology has been structured so as to provide more of the practical efficiency to the students with an objective to deliver/develop highly skilled professionals. APTRON is the best summer training institute for mechanical engineering students in Noida,. The summer internship training for mechanical engineering students is designed and updated in coordination with the latest developments and the industry requirements. The summer training course for mechanical engineering students at APTRON is inclusive of summer training for 1st year/2nd year/3rd year/4th year mechanical engineering students that match up with the industry recommendations allowing the learners to utilize their holidays in the best way to enhance skills and improve their future career prospects. To perform heating and cooling analysis of commercial structure. Why mechanical engineering students should go for summer training course? A large number of things in our everyday life operate through mechanical engineering technology i.e. from- small-scale printing nozzles to machine tools, micro-sensors and spacecraft. In the current world, practical skills are of utmost importance that demonstrates one’s ability to work and manage the entire project and also their ability to deal with the problems. The degree course curriculum does not necessarily involve provisions to develop such skills and this raised the importance of summer training for mechanical engineering students. As other engineering streams, summer training/industrial training for mechanical engineering students is equally important for the completion of their degree course. Due to increased technological advancements industries seek for highly skilled individuals to handle their operations and the summer internship training for mechanical engineering students focuses on the same. Hence summer training course is highly beneficial for the students for their career enhancement. 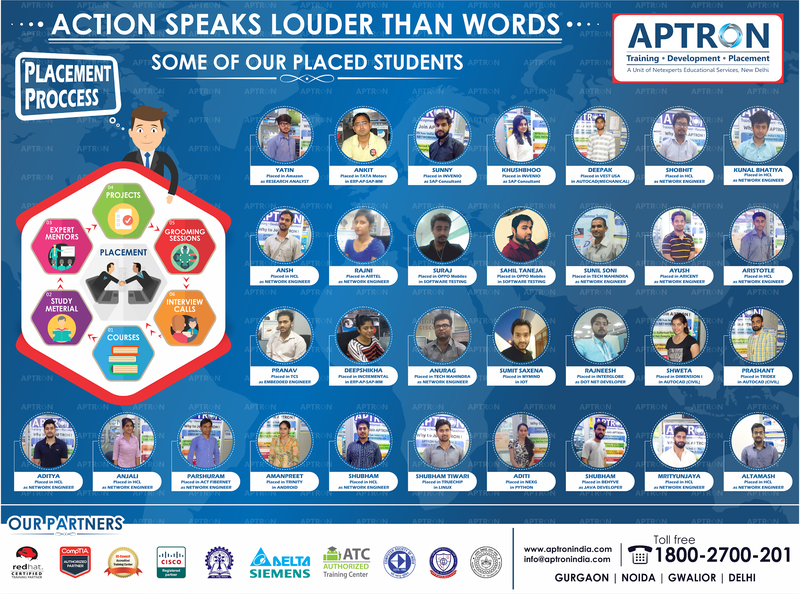 APTRON is one of the best companies offering summer training/internship for mechanical engineering students in India and opens the gateway to a promising future. Big data on – MovieLens Data processing and analysis. Design and Analysis Of Connecting Rod By Using ANSYS. Design and Analysis Of Piston By Using ANSYS. Design and Analysis Of Deep Groove Ball Bearing. Contact Analysis Of Deep Groove Ball Bearing By Using ANSYS. Analysis Of Thrust Ball Bearing By Using ANSYS. Contact Analysis Of Railways Wagon And Railways Track. Analysis Of Shock Absorber By Using ANSYS. Analysis Of Knuckle Joints By Using ANSYS. Analysis Of Turbine Rotor By Using ANSYS. Analysis Of Cotter Joints By Using ANSYS. Analysis Of Universal Joint By Using ANSYS. Q.When will the summer training/internship for engineering students begin for the year 2019? Summer Training/Internship Program in Noida, India will commence from May 2019 and will last up to the month of August. However the exact date depends upon the dates disclosed by the various colleges and Universities across India. There would be around 5 slots regularly in the month of May, June, July and August in order to ensure that each student finds it comfortable to start with the summer training on time. Q.What is the selection criterion for the Summer Training? There is no specific selection criterion for summer training at ATRON. However we have only limited seats for the respective seats and once it gets duly filled the registration for that particular project would get closed. The seats for summer project training are located on the first come and first serve basis. Q.What is the last date to register for Summer Internship training program at APTRON Noida,? The last date to register for the 4weeks/6weeks summer training in Noida, at APTRON is August 2019. However, in case if the seats for the particular project gets filled then registration for that course/project will be closed at that very moment. Q.What if I have already completed the registration process and later due to some reason the project is already closed/cancelled, will I be getting the refund for the same? Yes, if the registration for a particular summer internship project is closed/cancelled, then in such cases the same would be conveyed to the students and also the amount for the registration would be refunded. Q.What is the duration and fees for Summer Training/Internship Program 2019 in Noida,? APTRON’s Summer Internship Training in Noida, lasts for 4 weeks/6 weeks as per the official course curriculum declared by the University/College applicable for the candidate. APTRON’s summer training course fees is quite affordable and reasonable too. Q.Do you provide any accommodation to the students? No, we do not provide any accommodation at the institute. However we assist the students to get accommodation in the nearby hostel/PG. There are number of P.G. and Hostels located at a walking distance from the Institute for both the males as well as females ranging between 5-6 thousand. The cost of the same is to be borne by the students. If you are looking forward to go for summer internship then gear up and enroll yourself with APTRON for the summer training program 2019. It is the best summer training institute that offers best practical based summer internship training in Noida. During the summer internship training, the interns are assigned with a specific task and it relies on the internship program, organization and task that whether the interns will get paid or not. Summer internship training varies from full time to few hours as per the chosen internship programs and duration. At APTRON the summer training course is conducted in weekdays, weekend and fast-track batches. The actual duration however depends up on the type of program chosen. Q.Which is the best summer internship Training Center in Noida? To know about the best summer training institute in Noida, please go through the course curriculum and the training methods. APTRON is one of the best summer training institutes in Noida that focuses on making the learners skilled professionals by allowing them to work on live projects. Q.Do you offer projects for the various summer training courses? Yes, we do offer projects in the Summer Internship Training program for the respective technologies chosen.